The inaugural night of this U.K. jaunt see’s the Welsh wonders ascending to the giddy heights of arena rock touring. The show is far from sold out with many empty seats on this cold December night but the arena floor is fit to bursting point with a youthful, enthusiastic audience. Before we see how Bullet For My Valentine fair on the big stage, we get two hungry British acts chomping at the bit to stake their claim to the Brit-rock throne. Openers Young Guns attempt to warm us up with their brand of emotive pop rock. Despite suffering sound issues early on which makes the vocals inaudible for much of the first number the lads plug away regardless like true professionals. The audience’s response remains relatively tame until closing number ‘Bones’ with a dynamic chorus the number manages to get the crowd singing along. Perhaps a less metal orientated audience would be more applicable for this act but unfortunately, this was not their night despite a gutsy showing. The reception afforded to Asking Alexandra is far more enthusiastic. The spiky metalcore band are by far the heaviest act on the bill with their post Killswitch Engage screamo angst being aimed squarely at the audience of disaffected teenagers. Whilst Danny Worsnop’s harsh vocals lack powerful distortion to back them up, the York based act make up for their downfalls by delivering an energetic performance. The bright side is that Asking Alexandra may be the gateway act for many younger fans to discover far more edgy new artists. With a flagrant disregard for their own personal space, fans are pinned to the barrier in anticipation of tonight’s headliners. 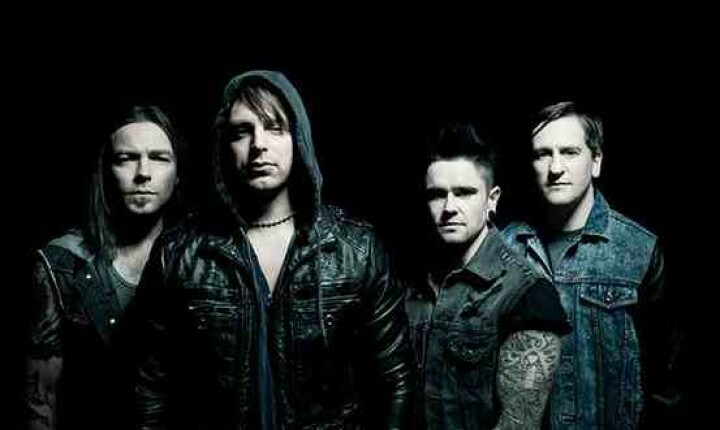 Bullet For My Valentine have made a career from combining diluted thrash riffs with pop choruses something which has drawn as much criticism as praise but once the union flag covering the stage falls to signal their arrival the reception that greets them is thunderous. Blazing pyrotechnics accompany ‘Scream, Aim, Fire’ but while Matt Tuck may garner much female attention it soon becomes glaringly apparent that the band look lost on a stage this size. Aside from headbanging on the spot there is little movement onstage and while Tuck utilised the ramp at the rear of the stage their performance is delivered somewhat cautiously. The rest of the band offer little to back their frontman up either, content to perform their parts on the spot. Although guitarist Padge delivers a decent, if heavily Metallica influenced solo spot. Unfortunately the band seem to lack the energy of acts many years their senior, perhaps some of this can be attributed to this being the first night of the tour. Their easily digestible pop metal sees the crowd bringing the energy, with ‘Your Betrayal’ provoking several moshpits’ gleefully throughout the arena. Whilst Bullet For My Valentine may not be classed as edgy or inventive their songs have hooks a plenty. Tuck is James Hetfield in espadrilles and whilst the band are nowhere near the calibre of their heroes there is a certain charm that comes from knowing the band were weaned on classic rock and metal. Adopting a slower tempo ‘Bittersweet Memories’ receives a muted response but a medley of hits including early number ‘Hand Of Blood’ brings the crowd back on side. Questions of authenticity will still haunt them, especially after a lacklustre encore spearheaded by an unnecessary pub rock cover of Motörhead’s ‘Ace Of Spades’ with Tuck giving a cringeworthy speech about Rock N’ Roll and a patronising dedication to “The older members of the audience”. The saccharine ‘Tears Don’t Fall’ brings the curtain down on the show with a whimper rather than a bang. Tonight saw a proficient but unspectacular outing for the Brit Metal foursome who have much work left to do if they are to cut it at this level. I am hopeful that the energy in their performance will gain momentum throughout the remaining of their UK tour.